Tristan envisioned the Dread Spear as a blend of the tough and the beautiful. I love the romantic style of her features here. Here she is, conjuring a ball of flame. Because that’s how she rolls. Another Rovann pressed into service in the invading army of the Ten Plains King, Samine is a Dread Spear – a battle-mage skilled in the conjuring and control of sorcerous flame. Tough, wily and confident, she’s keen to show her comrades what she can do, but she’s no fool. When the plot thickens, she’s one step ahead of the rest. 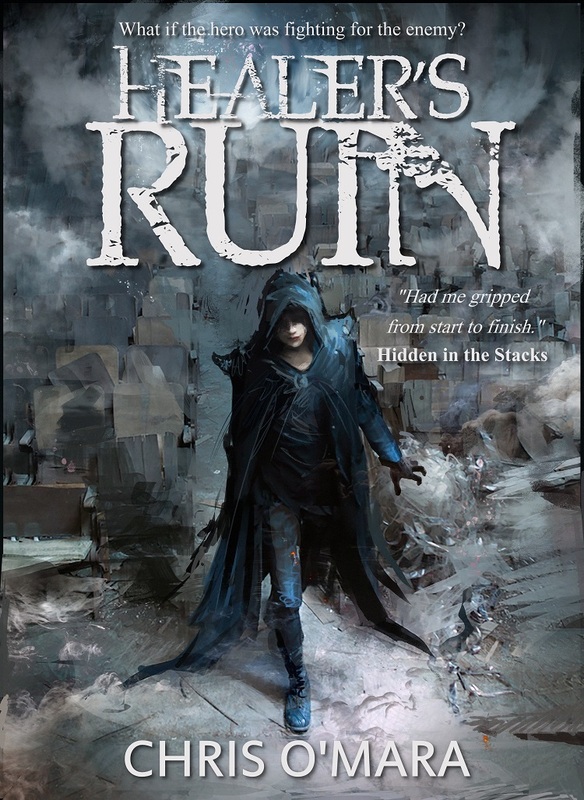 The lovely Tristan Roberts captured the likenesses of two main characters from Healer’s Ruin. Let’s meet the main man, the Healer himself. A Rovann from the southern continent, Chalos has been conscripted into the army of the Ten Plains King. Young and studious, thoughtful and brooding, he’s unused to the soldier’s life, but his healing hands quickly make him a valuable asset. But being noticed is not always a good thing during war, and before long the Healer is sent to the front lines. The Kingdom of the Riln lies to the north, across the ocean. A land as rich in bounty as it is in mystery, this marks the last great dominion lying between the Ten Plains King and control of the Spine of the World. From the frayed beaches of Gollinor Bay to splendid Aphazail, the Kingdom of the Riln is stalwartly defended by its people. But the army of the Ten Plains King is vast, employing terrific sorcery and martial prowess in equal measure. None have stood long against this army. The Riln are doomed to fall. But not, it seems, without a fight. Into this steps Chalos the Healer. He doesn’t carry a sword and has never killed anyone. But what he can do is knit together the wounds of war, drag the dying back to their feet, reassemble smashed bones and repair severed veins. But it is not just bodies that are ravaged by battle. And things are never as simple as they seem.